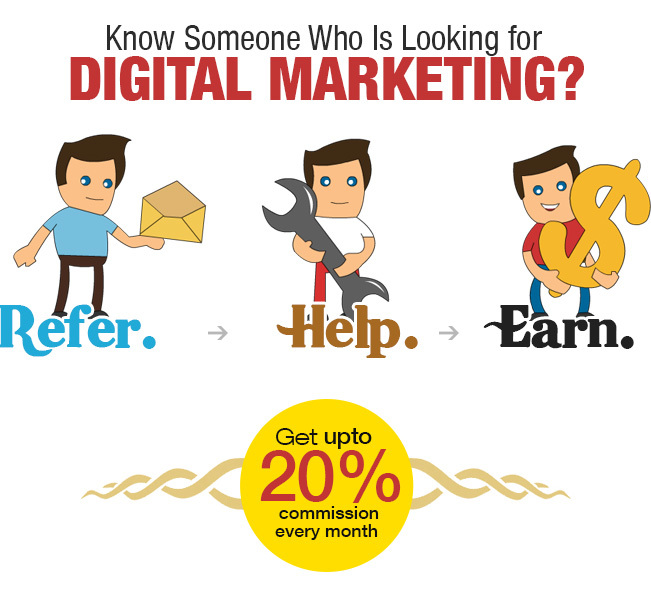 Digital Marketing is the need of the hour for every business. However, there is a dearth of digital marketing companies which can execute well. We are “Boldly, the most knowledgeable digital marketing team” and “ROI-focused” (Great returns and value addition is our guarantee). See our work at here. We will ensure high returns for every client. It took us 10 years to reach where we are today. More details added under Appendix. Most websites/professionals need Digital Marketing Help. If you know someone who has a need of our services then refer us to them and earn commission. We will pay you 5% to 20% every month till the project is running. Look for: your company, your friend’s companies, small business-owners, companies owned by relatives/friends etc. Our minimum fee per month is INR 20,000. So, look for people who can invest over INR 20,000 ($400) per month for better returns. How will the client referred by you benefit? If their business is good, they should break even within 4 to 8 months. In other words, our work will be able to generate more profit for the business than what they are spending with us. For instance, a company spending INR 50,000 per month on digital marketing channels can make INR 50,000 to INR 60,000 in profit within 4 to 8 months (provided their business is getting accepted well). It is a WIN-WIN-WIN for all, Win for you, Win for us and Win for the clients whom you are referring.